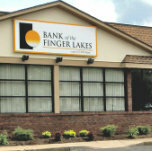 Bank of the Finger Lakes is a unit of USNY Bank, a full-service community bank based in Geneva, NY. We opened for business in 2007. Bank of the Finger Lakes specializes in providing comprehensive banking services to small and medium sized businesses, agribusiness enterprises, and farming operations. We are also active in financing professional practices and commercial real estate owners/developers. If this is your first experience with Bank of the Finger Lakes, we'd like to invite you to explore the ins and outs of our website or to drop by at any time to learn more about our thorough approach and deep commitment to our customers. If you're already a Bank of the Finger Lakes customer, we'd like to sincerely thank you for your trust in us and also vow to continue providing the ever-evolving value you've come to expect and deserve. Welcome to your local, community bank, where banking is a whole lot easier. Because we are a local, independent bank, our focus is exclusively on the communities we serve. Our bankers are your neighbors and you can expect great service at Bank of the Finger Lakes. Although we are small, we are a full-service bank with the resources available to help you achieve your personal and/or business financial goals. Our bankers are experienced and dedicated to providing you customized services to fit your banking needs. We are proud to say that all of our decisions are made locally, right here by people you know and trust. Our focus is helping our communities grow. Our focus is you. Stop in today, and experience your true community bank.